Unicorns are people, too...: Ladies and Gentlemen, Let the Freebies Begin! Here we have a set of 5 matchbook notebooks with 15 pages of recycled newsprint paper in them. We've got some cycling elephants, some circus poster taglines and the beautiful trapeze artist alongside her elephant pals (her elephant pals are on the reverse side :)). This one has rules just like the last one did so keep on reading! Also, by becoming a fan on facebook, that's another way to keep up with the doings of ECS like sales, new products and shows! Let me know which act it is that brings or would bring you to the circus. I'll start. I love the animals. The boring ones are okay, but mostly I like the dangerous ones. The elephants with their sharp tusks, the lions and tigers with their man-flesh-eating-ness and the alligators who also eat fleshy men. I love the danger in it. :) Now you. What is your favorite act at the circus? So leave a comment on this blog post telling me all about your circus habits, and I can't wait to read them! Plus you'll be entered in the drawing. :) Also, if you join the Ehle Custom Stationery Ehlebots, there are discussion boards and other ways to get savings and new product reveals. We've just got all sorts of stuff going on! The giveaway starts as soon as this is posted (if you're reading it now, that's now!) and ends Sunday night. Joey and I will be picking a winner Monday morning sometime so tune in then to see the winner! 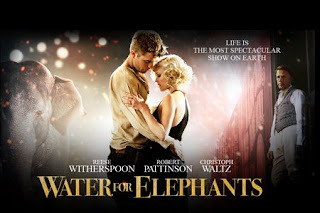 Just remember: elephants are our friends, R-Pat and Rees are tremendous actors and unfortunately good-looking people, and, hence, you should go see Water for Elephants. :) Ciao, bellas! I liked watching the elephants march around the ring. Epsecially when there's a little elephant marching behind an adult elephant while holding the adults tail. My circus habits include gorging myself on cotton candy and singing the national anthem. Last time I was at the circus it was sometime before I was four but my Mom says I liked it. I was pretty dissapointed when I was informed that there are no longer side shows... I suppose i would attend the circus for the monkeys dressed up like people =) Not sure what my circus habits are because I have not been, but I would like to find out. I love the circus!! My favorite act would most definately have to be the elephants and their super fun tricks. It is so cool to see giant elephants do dainty tricks. The elephant rides during intermission are fun too!